The night before we left for a break at home in England, we wandered down to the town centre to walk off a big dinner. To our surprise the town was lit up in celebration of a bike ride on the morrow. I hope you like this composite picture. Down by the river, a track had been set up on the sandy margins leading to the Ecovia – the ecological path that runs along the banks of the Lima. It's a great place to walk or cycle. In fact, on one of our visits to the Casa de Outeiro, Dona Ana's many children and grandchildren had gathered for a fun day out. A friend with a van took some canoes up to the next town on the River Lima, Ponte da Barca, then twenty or so of the Abreu e Lima family cycled up the Ecovia, took the boats out of the van, put the bikes in their place and returned to Ponte de Lima by canoe while their friend drove the bikes back home. 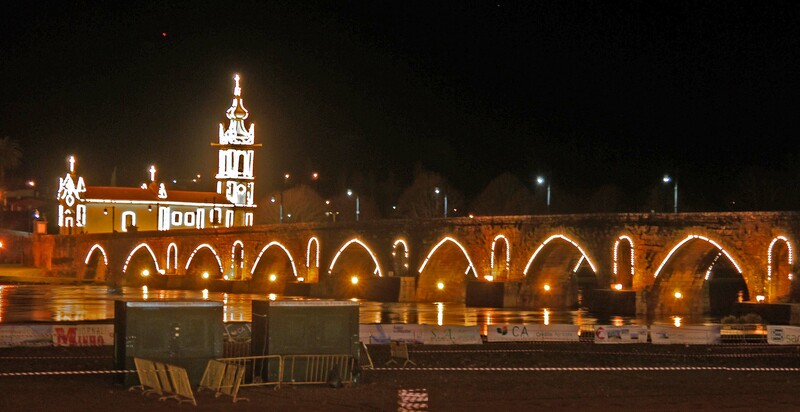 If you look in the picture below you can see some of the temporary structures being set up to cater for the cyclists in the rally that we missed with the Roman bridge lit up behind. And doesn't the church look great picked out in lights? By the way, the tilt to the tower isn't the fault of the camera angle. The church of St António in Arcozelo, the area across the river, is the Minho's answer to the leaning tower of Piza!